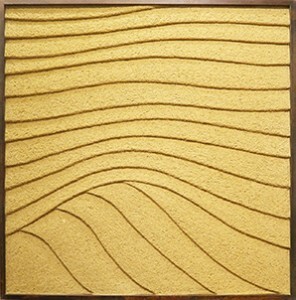 Born in Awaji Island, Japan in 1972, is the third generation of a traditional plaster artisan family. At the age of 23, he formed his own plastering business. In addition to his work in Japan, he has overseas experiences, particularly in Germany, France, Singapore and so on. As a master of an ancient, traditional art form, he has been involved with various restoration projects. His capacity as an artist extends beyond traditional works, with many of his projects involving interior and exterior coverings of commercial, educational, and residential buildings. The tea house of Heisei-no-in at the Golden Pavilion, Kyoto imperial palace, Katsura imperial villa, Lounge space in the main building of Tokyo National Museum, etc.